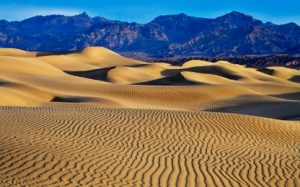 Death Valley National Park straddles eastern California and Nevada. It’s known for Titus Canyon, with a ghost town and colorful rocks, and Badwater Basin’s salt flats, North America's lowest point. Above, Telescope Peak Trail weaves past pine trees. North of the spiky salt mounds known as the Devil’s Golf Course, rattlesnakes live in Mesquite Flat Sand Dunes.